5 Bedroom Detached House For Sale in East Sussex for £1,495,000. NEW SHOW HOME LAUNCHED - Please call to book your appointment to see this incredible location. 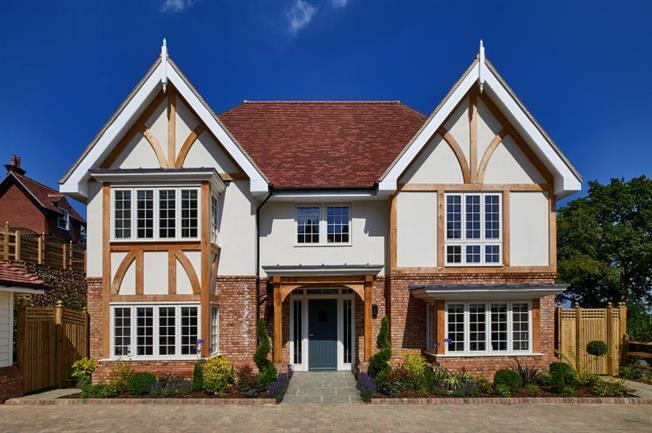 The Willow is a beautifully proportioned five bedroom family home. This impressive double fronted property features the traditional oak timbered and brick style as is popular and sought after in the local area. The attached barn style garage has plenty of parking for two cars undercover whilst the driveway allows plenty of room for visitors. The covered entrance opens into the spacious hall with stairs to the first floor. Double doors open to the formal sitting room with fireplace which in turn has doors leading out to the garden. The dining room has a bay window to the front as does the study. The kitchen/dining and family room allows plenty of room for sumptuous entertaining leading to the garden through by-fold doors. The kitchen with fully integrated Siemans appliances, island and separate utility room has everything required for modern day living. The staircase, with oak handrail and spindles lead to the first floor with a large feature window to the front. Upstairs, the master bedroom suite has a dressing area with built in wardrobes and an ensuite bathroom with bath and seperate shower. Bedroom two also benefits from an ensuite shower room. There are three further bedrooms and a family bathroom. Outside the paved terrace can host luxurious outdoor entertaining and the garden is designed with well screened hedging, lawns and landscaped borders. Countrywide Residential Development give notice that all particulars are for guidance only. Photograpghs and CGI's are a respresentation only..